Payday arrived on Friday and by Saturday I was indulging upon a few sale finds (unsurprisingly) – completely justified by the dramatically reduced price-tags and quality of items available. You’ve probably already noticed that I’m a huge fan of rummaging through the sale racks – or more accurately, have become fond of the hobby as my purse strings have tightened and age has increased over the years. The blouse pictured above, a petite size 6 Topshop number – cost just £15. With a high-rise back, ruffled/floaty hemline and tight neckline – this blouse, and its vintage style, naturally appealed to me from the very first glance. I also discovered another item during my ‘thrifty’ Topshop rummage – a really cute, retro beige skirt, completed with central fabric buttons along the front and a synched in waist. Usually retailing near the £40 mark, but on-the-day, an absolute steal at just £7! I haven’t had the chance to document this yet, but fear not, as I’ll be sure to share a few photos of the skirt when I next wear it. Next up, the wedges. 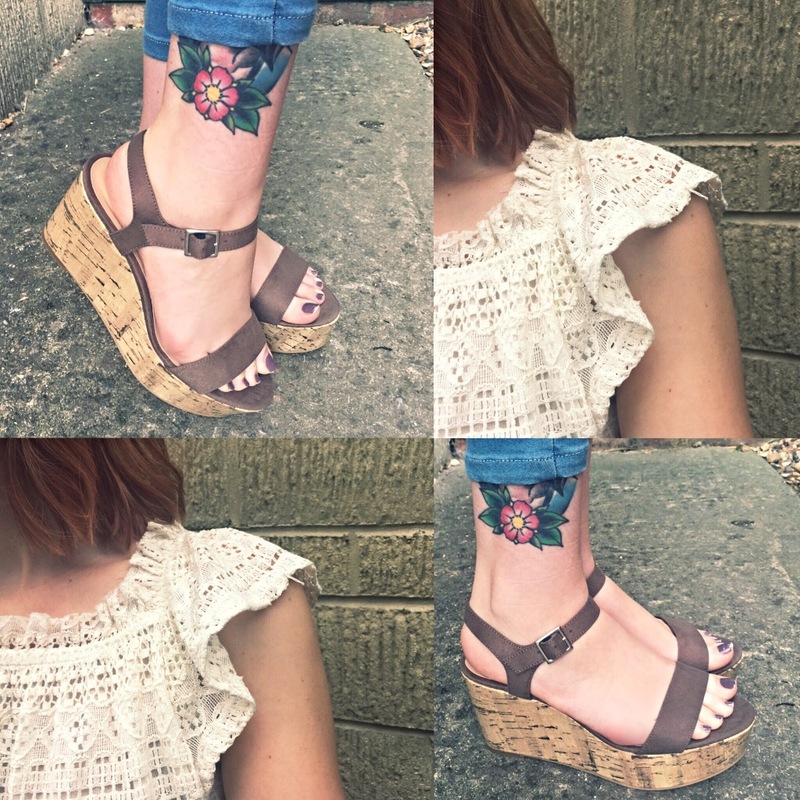 I must admit, the huge £8 sale sticker definitely attracted me to these size 5 New Look wedges. 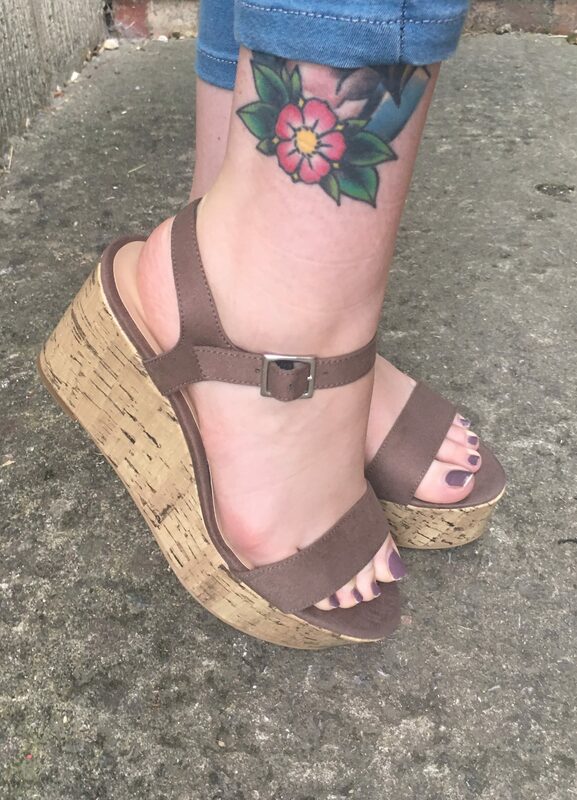 Any female with ‘average-sized’ (5-6) feet will understand the difficulty in finding a nice pair of appropriately sized shoes, so it was a huge surprise to discover these shoes, along with their attractive brown cork bases and grey faux-suede straps. Granted, after wearing the shoes once, I now understand the price-tag. Although a wedge – usually the safe, comfortable resort to wearing high heels, they are less than comfortable… and very clumpy/loud. 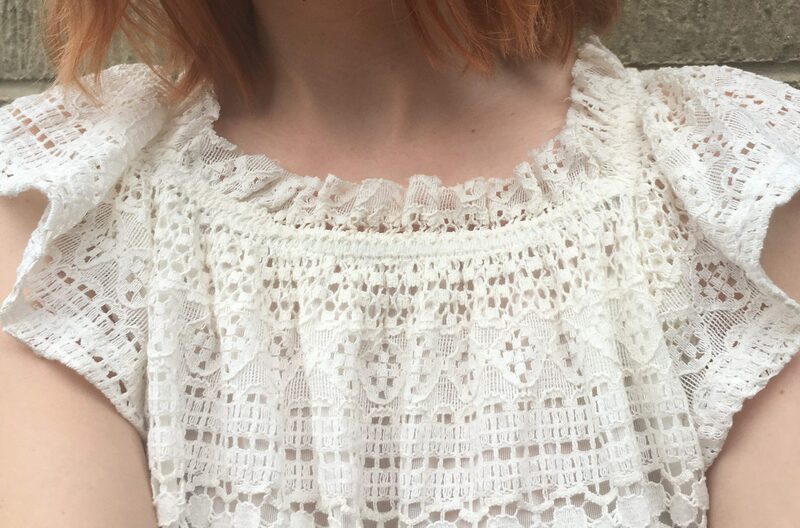 Nonetheless, once you master the technique of tip-toeing and get over the platform base (almost equal distribution of height), they’re definitely worth the £8 spend and compliment my new blouse seamlessly. Interested in reading more OOTD articles like this? Follow my blog and comment in the space below today! Love that look! 😍 those wedges are to die for!